► OSSEOMOLD is contraindicated in infectious cancerous areas, unless it is addressed properly. 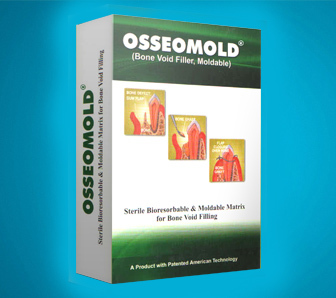 ► OSSEOMOLD is contraindicated for highly sensitive patients for bone graft materials. ►	OSSEOMOLD is contraindicated in clinical situations where any bone filling surgery should not be performed due to other pathological conditions. Like any other surgical procedure, care to be taken to monitor the health condition and the medication like steroid or anti coagulants taken by the patient which might affect the surgical procedure. OSSEOMOLD cannot be re-sterilized or re-used. Once the package is opened, the unused portions of the OSSEOMOLD have to be discarded. OSSEOMOLD has to be stored under normal room conditions of humidity and temperatures between 4° to 49°C or 39° to 104°F. OSSEOMOLD would have a minimum of 3 years shelf-life.